When Bill Clinton walked on stage last night I don't know who looked more surprised, Sting or wife Trudie Styler. 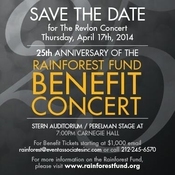 There was such uncertainty that Clinton would come, let alone give a talk to the star studded Carnegie Hall audience for the Rainforest Foundation's 25th anniversary, that he was never announced. And no mention of him was made all afternoon during rehearsals. But Clinton did show up, just at the end of Act 1, in the break between Stephen Stills' two songs, and rocked the house. The place went wild as Clinton not only spoke about Sting and Trudie's dedication, but let Kevin Spacey do imitations of the former president at the mike with him. "Sometimes you can't tell who's talking," Clinton said. Then referring to Spacey's role as a vicious president elect on "House of Cards," Clinton marveled of Spacey's Frank Underwood, "He's president and a murderer."